Last game for the NAB Challenge! GWS surprised us by blitzing St Kilda and Anthony has given us the fantasy relevant run down! 12 Days till Round 1!! 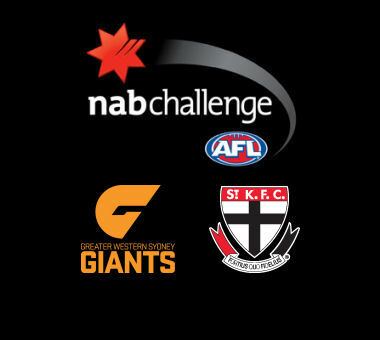 GWS Giants v St Kilda Saints. Wagga Wagga. Saturday 1st March, 2013. So in the last official NAB challenge game of the round and only 12 days till the start of the season, we’ve seen two teams with practically their best 22 on field. This is not great news for the Saints who were on the negative side of a 68 point loss to the Giants, set up by a blistering 2nd quarter! I’m sure there will be lots of talk about where both teams are after this game, but we’re here to check out how they’re looking fantasy wise! As always TOG is the Time On Ground percentage. Dylan Shiel – ($390,400- MID) The Giants looked very impressive today but for me he was definitely best on ground. It wasn’t just his 3 super goals as a midfielder that makes me say that, but the pressure he put on the ball carrier today was vicious, finishing the game with 9 tackles! That’s promising for me because when GWS aren’t destroying a team we know he’ll still be racking up +4’s with tackles! Finished with 90 points from 73% TOG. Adam Treloar – ($482,100 – MID) Completely off the leash today and running rampant. Game high 32 Disposals and 131 points from 78% TOG. Big fan of this kid. We know this kid can score when he wants but is this the year we’ll see some consistency? If this and last NAB game are anything to go by he could be worth a risky/smokey pick as a POD. Rhys Palmer – ($394,700 – MID/FWD) Speaking of risky picks, here’s someone who’ll take some serious… guts… to pick. Threw his body at every contest today and got a fair amount of ball. If he keeps attacking the ball with that kind of intensity he’ll be stiff to get dropped. 128 points from 72% TOG. Thomas Bugg – ($295,000 – DEF) Started the game like a house on fire getting a lot of ball early with GWS players looking to get the ball into his hands coming out of defence (the same role he played in the first half of last year). The thing to focus on here is that he scored his points when the game was there to be won as opposed to inflating his score during junk time. If he continues to play this role then he could be a lifesaver down back! 128 points in only 68% TOG! Jimmy Webster – ($235,500 – DEF) Here’s another cheap defender putting his hand up for us. Ran hard all day rebounding out of defence. It looks like he’s playing Dylan Roberton’s role from last year. Roberton injured his ankle last year, pretty badly in the last game but I haven’t been able to find an expected return date so I’d want to do more research on that before I’d take the gamble. Webster really stood out last week though and again today. 83 points from 88% TOG. Leigh Montagna – ($606,000 – MID) Montagna really didn’t impress today. In a day where the experienced Saints needed to stand up, he was very quiet. Really should have lead from the front instead of floating around in 2nd gear. 71 points from 80% TOG. Lenny Hayes $470,400 – MID (52 points 44% TOG) Was on track delivering his usual legendary magic until his hamstring pinged. Was subbed off and we will await result. Monitor carefully before drafting. Stephen Coniglio $413,400 – MID (18 points 8% TOG) Looked very good to start but a crunching tackle knocked the wind out of him early, possible whiplash. Failed the concussion test and was unable to return to the field. Should be right for round 1. Maverick Weller $306,700 – DEF (77 points 69% TOG) Still rookie listed for the Saints but the desperately need mature bodies and he provided that today. Watch him if he gets upgraded. Didn’t see the game but what happened to my boy Toby Greene? Average game for Toby, 63 points from 68% TOG. Too be honest I didn’t really see much of him, one of those games where he just kinda floated around. Thanks Anthony. How was Jed Lamb? Thanks Anthony. Interesting comments re Webster. Aim hating trouble D6. Kolo needs to be replaced…Webster perhaps? Who else? Dunstan vs Michie for M8? What was your thoughts on Mummy?